I am in the process of preparing some material on John the Baptist in Biblical and Church History. There is a tradition that John was buried at Samaria. This is one of those late traditions that reflect the understanding of believers in the centuries following the time of John. Jerome Murphy-O’Connor makes some comments on this in the fifth edition of The Holy Land. See our earlier reference to the book here. Samaria is in the West Bank of Israel, under the Palestinian Authority. It has been impossible to visit Samaria on a regular basis for many years. My last visit was in 2000, but I was trying to use the “latest” in digital technology. The photos are not very good. Another thing to remember about important sites like this is that they are not well maintained. Here is a photo of the Church of St. John that I have scanned from a 1984 slide. At the Biblical Studies Info Page I keep a list of good sources for photos (check Scholarly, then Photos). None of these have a photo of this site. On May 19, 2005, some scholars associated with the Studium Biblicum Franciscanum in Jerusalem made a visit to Sebaste (Samaria). There are several good photos of approximately 800 x 600 pixels, with commentary. These are stashed away in the archives of the web site. Perhaps you can access them here. These photos include the Iron Age site belonging to the time of the Divided Kingdom, and the Herodian and Roman site from the time of the New Testament (Acts 8). Here is a comment from the Franciscan site about the two churches at Sebaste identified with John. The Alleged Discovery of the Baptist’s Head. It is not known what happened to the head consigned to Herodias; but as early as the fourth century, stories begin to appear about the finding of the supposed relic. One such inventio took place in Sebaste in the place regarded as the Baptist’s prison. 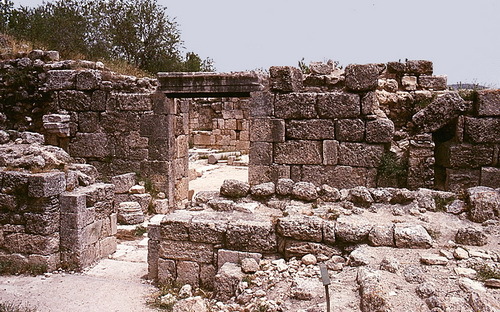 A church associated with this discovery was erected near the acropolis, while the large church containing the tomb was below to the east, in the cemetery area. 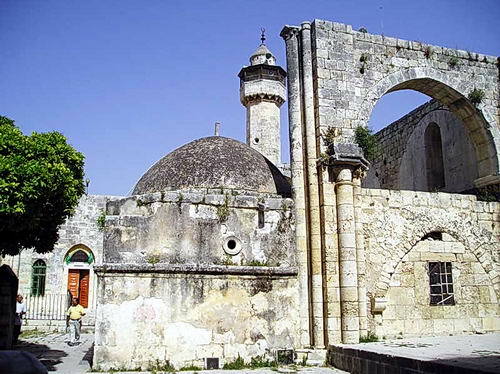 The cathedral from the mid-12th century, now a mosque, is said to enshrine the tomb of John the Baptist. The church is in the village of Sebaste. I am taking the liberty of showing you the photo of the exterior of the church from the SBF web site. This entry was posted in Bible Study, Israel, New Testament, Old Testament and tagged John the Baptist, Palestinian, Samaria, Sebaste, West Bank. Bookmark the permalink.